Terry and I decided to get a Christmas tree this year. We have not had one for the past two years due to my layoff and our desire to be careful with finances. This year, however, given the election results, we needed the comfort, and with the small windfall from my internet domain sale we decided we could afford one. So off we went to a Christmas tree farm that my brother had recommended. We got plenty of exercise. The first select and cut area had only trees bigger than we wanted. We found that there was another select and cut area with trees closer to the size we wanted. We looked, we saw, we found, we bought. This was on Friday. We brought the tree home and put it in the stand I had bought at Target. It would not stay stable. It kept tipping over. I went off to Target for a larger stand, only to find that they were completely wiped out in that section. We stabilized the tree for overnight and decided to return to the effort on Saturday. We realized that we had made two mistakes. 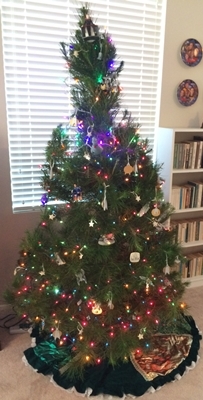 First, in our effort to make the tree look straight at the top, we did not situate it properly in the base. Second, we had too much trunk beneath the branches making the tree unstable. On Saturday we cut four or five inches off the trunk and made sure the tree was solid and secure in its base. We began decorating the tree. We had some problems with our Hallmark Star Trek ornaments plugging into the light strings. We’ve had them for many years and the contacts can get out of whack. But we fixed that for the most part and now we have a beautiful, marvelous Christmas tree, our first since we’ve moved south.